Chevron’s tax practices, and those of other corporations, have huge implications for the living standards and public revenues to fund essential services in countries across the globe. Chevron’s aggressive tax avoidance schemes require much greater public scrutiny as billions of future tax revenues are at stake. It is time to take action to level the playing field and make sure that companies like Chevron are paying their fair share. Additionally, Chevron’s own annual report reveals that tax filings have not been approved by the United States government since 2008; in Nigeria since 2000; Angola since 2001; Saudi Arabia since 2012 and Kazakhstan since 2007. Chevron is unable to estimate the tax it may be required to pay given the ongoing examinations by tax authorities in countries around the world. Chevron’s Gorgon project in Western Australia - which also includes Shell, Exxon and several Japanese energy companies- is crucial to Chevron’s future growth and will make LNG Australia’s largest export. The current ATO lawsuit against Chevron involves a high interest AUD$2.5 billion scheme between a Chevron subsidiary in the US state of Delaware -one of the world’s most used tax havens- and Chevron Australia between 2004 and 2008. In 2009 Chevron created a new high interest AUD$35 billion ‘credit facility’ between Delaware and Australia. The result of this scheme is to reduce profits in Australia, where they might be taxed, and generate profits in Delaware, where they are not taxed. While operating revenues in Australia have increased by 15% since 2011, interest charges to the Delaware company have increased from 26% to 62% of operating revenue. As a result, profits in Australia have decreased by 83%. In 2014, Chevron Australia’s related party interest charges were more than five times greater than profits. It would be difficult to argue that this is not an intentional scheme to reduce profit and avoid taxes in Australia. The tax avoided by Chevron’s latest scheme could be larger than Australia’s 2015-16 federal budget for education or more than half the budget for health. Chevron, the US-based global oil giant, is now the largest foreign investor in Australia. The Chevron operated Gorgon liquefied natural gas (LNG) project in Western Australia is the largest resource project in Australia and the largest LNG project in the world. When the Gorgon gas begins to ow, LNG will overtake iron ore as Australia’s largest export. Given Chevron’s aggressive tax avoidance schemes, Australians should be very concerned about promised revenues. Gas from the Gorgon project is expected to begin owing this year, with an estimated annual post-tax operating cash flow above US$8 billion from 2019-2032 and continuing above US$5 billion per year until 2057. However, Chevron and others have indicated that no royalty payments (PRRT) will be paid for at least the first 8 years of operation. Over the last two decades, Chevron has paid billions to settle tax disputes involving the United States, Indonesia, Saudi Arabia, Japan and many other countries. However, through armies of lawyers and a myriad of related party deals, Chevron may have avoided many more billions in global tax payments. In Australia, the Australian Tax Office (ATO) has an active lawsuit against Chevron, covering the years 2004 to 2008, for an aggressive scheme which was designed to reduce Australian taxes by hundreds of millions of dollars. At the same time the ATO is auditing other more recent Chevron tax schemes. Globally, Chevron reported stashing more than US$35 billion in un-taxed revenues in offshore accounts. Chevron’s complex business structure, involving subsidiaries in Bermuda, Singapore and Delaware, may facilitate aggressive tax avoidance in Australia. As the world’s largest LNG project prepares to ow, billions of future tax revenues are at stake. Australian taxpayers need to be wary. In Australia, the majority of Chevron’s Australian operations are owned through one company, Chevron Australia Holdings Pty Ltd. The Australian company is owned by Chevron Australia Petroleum Company, a shell company incorporated in Delaware. While the Delaware parent company holds over $10.6 billion worth of shares in Chevron Australia and has shifted $35 billion to Australia, it pays an annual tax bill of only US$175. The ATO has a current lawsuit against Chevron over the shifting of funds between Delaware and Australia. Between 2004 and 2008, Chevron shifted $2.5 billion from Delaware. The money was borrowed in Delaware at 1.2% and lent in Australia at interest rates above 9%. The alleged purpose of the scheme was to drain pro ts out of Australia and reduce tax payments. Chevron also owns hundreds of other subsidiaries in Delaware and in other tax havens under other names. With no explanation, Chevron Australia’s 2014 annual report notes $351.6 million has been set aside as an adjustment “for current tax of prior periods”. This amount is presumably to settle the ATO court case. This adjustment cut taxable income by more than half and helped deliver - courtesy of Australian taxpayers - a $5.7 million tax refund in 2014. In 2009, Chevron began a new $35 billion ‘credit facility’ between Australia and Delaware. This shift of funds, 14 times larger than the previous scheme, is to be repaid from 2016 through 2021. This conveniently matches the expected start of LNG flows from the Gorgon project. The interest rate appears to be above 5%. In stark contrast, Chevron’s subsidiaries in Singapore lend to each other at interest rates below 0.2%. In 2014 alone, this new scheme resulted in a $1.8 billion interest charge to the Delaware parent. This amount was not paid, but ‘capitalised’, and may amass more interest charges to be used later to further reduce taxes. Chevron Australia, in its recent submission to the Senate Inquiry on Corporate Tax Avoidance, has revealed that the ATO is auditing this and other tax schemes. Gorgon Cost Blowouts: Another Tax Scheme? Chevron’s bloated interest rates could divert profits from Australia to Delaware and offset future tax revenue by more than $35 billion. With LNG poised to become Australia’s largest export, Chevron’s aggressive tax avoidance schemes necessitate greater public scrutiny. Chevron, and other oil and gas companies, must be held to account for the bold claims they made, when seeking a social license to operate in Australia, about future tax contributions and other public benefits. Chevron’s latest scheme also raises questions of whether the $17 billion in cost blowouts on the Gorgon project - conveniently blamed on unions and environmental regulations- were genuine or intentionally inflated to reduce future tax liabilities in Australia. Chevron’s latest scheme also raises questions of whether the $17 billion in cost blowouts on the Gorgon project - conveniently blamed on unions and environmental regulations - were genuine or intentionally inflated to reduce future tax liabilities in Australia. Since 2011, Chevron Australia has reported annual operating revenues of over $2.5 billion. While some corporate tax was paid in Australia, Chevron received refunds from the ATO of over $25 million in 2011 and nearly $6 million in 2014. Do Australian Tax Payers Subsidise Chevron? Chevron’s operating revenues in Australia have been above $2.5 billion since 2011 and increased 15% by 2014. Meanwhile, interest charges to the parent company in Delaware have increased from 26% to 62% of operating revenue. Over the same period, profits have plunged by 83%. In 2014, Chevron’s interest charges to the Delaware parent were more than 5 times greater than profits in Australia. This level of internal interest charges could not be sustained by any normal business. Is this an intentional scheme to reduce profit and to avoid taxes in Australia? Making Australian taxpayers subsidise one of the world’s largest and most pro table oil and gas companies appears to be the effect of Chevron’s latest Delaware scheme. 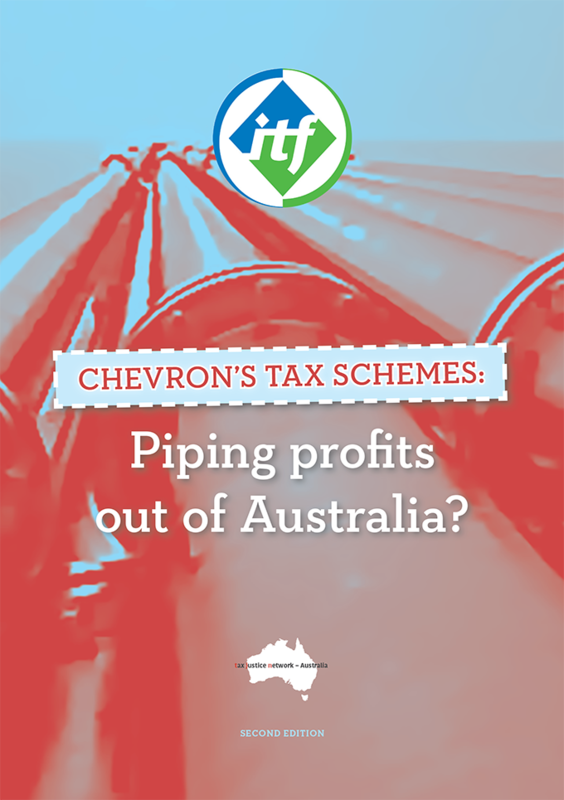 There are additional questions and concerns about Chevron’s tax practices in Australia. Much greater transparency and disclosure is required to reveal the full story. The potential cost of Chevron’s latest tax scheme is greater than the entire annual Commonwealth budget for education. It is also more than half of the nation’s annual health budget. Chevron’s tax practices, and those of other corporations, have huge implications for the living standards and the future of all Australians. It is time to take action to level the playing field and make sure that companies like Chevron are paying their fair share to support a fairer and more prosperous Australia for everyone.